Once the «Template Chooser» App has been assigned to you or you have acquired it via the Office Store/AppSource, it will automatically appear in the «Home» tab of your Office application ribbon. To launch the App best click on the «Templates» button. Be aware that the name of the Button «Templates» can vary based on the Office language you are using. Please note that the icon for the «Templates» button might vary depending on what Office application you are working in. Once the «Template Chooser for Teams» App has been added to a channel of a Team it will be accessible as a channel Tab/App. To launch the App best click on the «Templates» tab. Please note that the name of the «Template Chooser for Teams» tab can vary as it can be renamed freely. 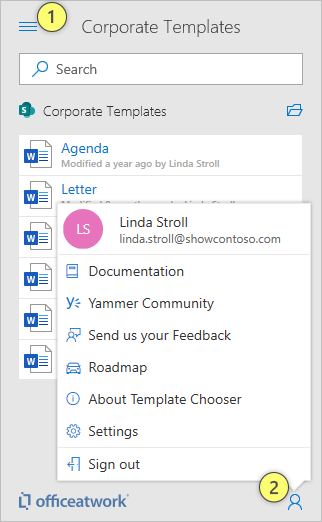 Once the «Template Chooser for SharePoint» App has been added to a Site Collection in SharePoint it will be accessible as a Button on any document library within that site collection. To launch the App best click on the «Templates» button. Be aware that the name of the Button «Templates» can vary based on the browser language you are using. 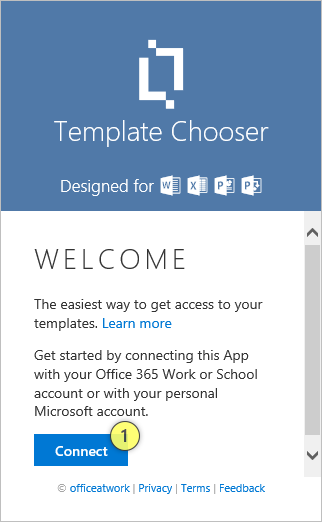 To get started with the «Template Chooser» you need to connect it with your Office 365 work or school account or with your personal Microsoft Account. Click the «Connect» (1) button to start the process. The actual sign in experience is provided by Microsoft. The first time you connect the App you might be asked to consent to the permissions the App requires. Please go through those permissions carefully and grant consent as the App requires these permissions to function. If you do not grant consent the App will not work for you. The navigation within the App is split into two sections, the «Libraries» and «User» menu. The «Libraries» menu (1) will provide access to all of your content libraries. Use this menu to switch between libraries. 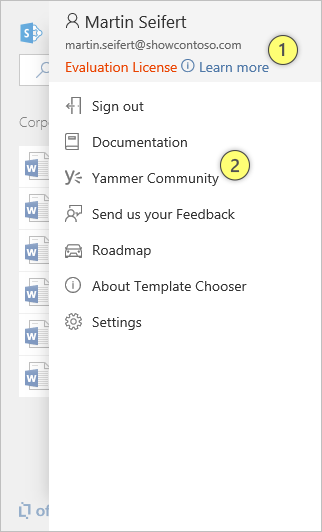 The «User» menu (2) will provide links to resources such as «Yammer», our «Feedback form», the App «Roadmap», the «Settings» page, the «About» page and the App documentation (website). Additionally, it will allow you to sign-out of the App. The «Info» button (1) will provide you some more info relevant to the topic right within the App without leaving the App.